Three strategic historic buildings in the Whiskey Row project in 100 block of West Main Street are targeted for redevelopment with a mix of restaurants, shops, offices and apartments, the developers say. The adjacent structures — 111, 113 and 115 W. Main, all of which date to the mid-1800s — will be combined into one project and function as one building, with about 85,000 square feet of space. The site is being marketed as 111 Whiskey Row, the developers said. No tenants have been signed but initial interest was described as significant by Valle Jones and Craig Greenberg, Whiskey Row's co-developers. They are working for the preservation-minded investment group that bought five adjoining Whiskey Row buildings in 2011 from Todd Blue for $4.85 million. The group, Main Street Revitalization, is led by some well heeled individuals with ties to Brown-Forman Corp. And Brown-Forman as a corporation is one of the partners. Brown-Forman also recently announced that it had purchased two of the five buildings from Main Street Revitalization — adjacent structures at 117 and 119 W. Main — that the spirits producer plans to redevelop as a distillery and bourbon experience honoring its founding brand, Old Forester. Greenberg and Jones said Tuesday that they expect soon to transfer the title to Brown-Forman for the two Old Forester buildings that stretch from Main to Washington streets, but they declined to disclose the purchase price. Meanwhile, Brown-Forman has filed documents with the Metro Department of Planning & Design Services indicating that its two, four-story buildings will include the distillery, a visitor tour bourbon experience, a restaurant, retail space, upper-level event space and meeting rooms, along with a rooftop bar and garden. Brown-Forman intends to apply for a change from C-3 heavy commercial to EZ-1 zoning to accommodate the property's redevelopment. The new zoning will need approval by the Metro Planning Commission and the Louisville Metro Council, and the design of the project must be reviewed by the Waterfront Development Corp.
Greenberg and Jones said the market and leases will ultimately determine how space in the 111 Whiskey Row complex is allocated. Jones declined to speculate on how many dwellings might end up being developed. There are already more than 30 large apartments available in the Whiskey Row Lofts project just west of the Old Forester buildings. The 111 Whiskey Row plan is for restaurants and retailing on the ground floor, at least two upper floors for office and one or more upper levels for apartments. Construction should start by mid-2015, with the full buildout uncertain but proceeding to meet signed tenant particulars, Greenberg and Jones said. The developers see numerous positive signs that 111 Whiskey Row will lease up fairly quickly. Jones noted that Waterfront Park and the KFC Yum! Center are both close by and that an Aloft hotel and other projects, including the planned renovation and expansion of the Kentucky International Convention Center, are either under construction or planned. Greenberg acknowledged that financing hasn't been secured, but he said the investors are pursuing obtaining both state and federal historic-preservation tax credits that could reduce costs. He said project architects, led by K. Norman Berry of Louisville, are working closely with state and federal historic-preservation agencies to make sure the restorations are as authentic as possible. 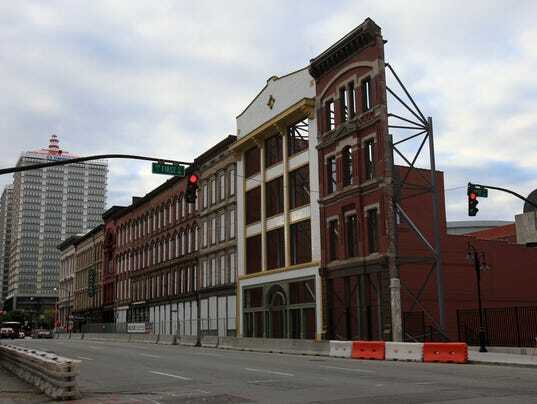 The developers said the investors have spent about $7 million on the purchase and stabilization of the Whiskey Row buildings. "We have been working on this project for a long time," Greenberg said. "We have a financing plan and we have finalized a plan for the redevelopment" of 111 Whiskey Row.